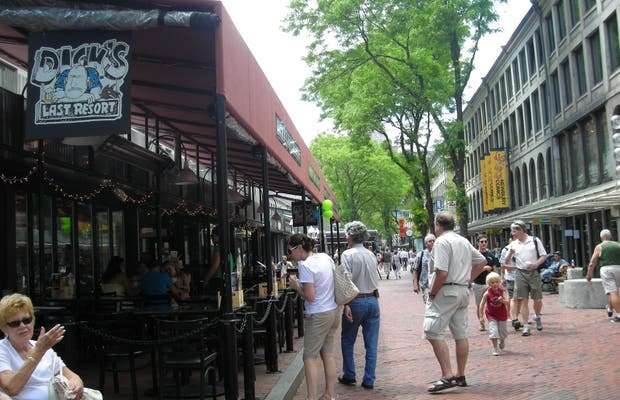 Quincy Market is now the quintessential tourist spot and one of the most visited places by tourists and even the Bostonians .... It's a totally "bright and vibrant" place, full of colourful street performers, places to eat what you dare, to walk around or to sit .... Full-art business clothes are "advanced" .... Especially for young people. Traveling the QUINCY MARKET and sniffing at each corner, is a refreshing and very interesting experience that you are sure never to forget. Expensive with same items cheaper elsewhere. Only tourists visit, never locals. Great place for food and shopping. Part of the Freedom Trail in Boston. Visit it’s a must in order to get to see the Cheers bar.